While discussing the undocumented SQL Server DBCC PAGE function with some fellow engineers I discovered that there aren't really any recent posts. Why is DBCC PAGE useful? Even with the improvements in technology most performance bottlenecks still occur within the storage layer. For this reason it can be very useful for a SQL Engineer to look into the way that data is actually stored within the database pages. To do this we need a function, and this is what DBCC PAGE offers us. The fundamental unit of data storage in SQL Server is the page. The disk space allocated to a data file (.mdf or .ndf) in a database is logically divided into pages numbered contiguously from 0 to n. Disk I/O operations are performed at the page level. That is, SQL Server reads or writes whole data pages. Extents are a collection of eight physically contiguous pages and are used to efficiently manage the pages. All pages are stored in extents. As I mentioned DBCC PAGE is an undocumented command, so this does come with no-warranty and won't be supported if you try and call support..... use at your own risk..... so be careful if you start using it on production! The first step before we run DBCC PAGE is that we must find out the Page ID that we are interested in looking at the DMF sys.dm_db_database_page_allocations as this will provide us the information we require. This DMF takes the following parameters. In earlier releases of SQL Server we had to use the DBCC IND([Database], [Table], [Unk],[Unk]) to obtain this information and the Page Id. database_id The database that the page belongs to. Only really relevant if you do not provide the Database ID to the DMF. object_id The Object ID that owns the page. partition_id The partition id within the database that this page is created in. extent_file_id The file ID that this page has been created in. allocated_page_iam_page_id The Page ID for the IAM managing this page. allocated_page_page_id The Page ID. We need this when we perform the next steps. page_type The numerical value that represents the page type. Refer below. page_type_desc The friendly name for the page type (e.g. DATA_PAGE). Refer below. page_level Describes the level that page exists at (e.g. 0 = Leaf level or Heap level in non-btree, 1 = Intermediate Level of the index, >=2 Additional Intermediate level or if the highest level then the root node. Once we have found this information we can start to dig further into the page we wish to view. But how do we identify which page to look at.... I'll cover that in another blog where I will explain the levels etc. For this post lets just take a DATA Page and view that, but how do we do that. We can see we have 2 indexes related to the table dbo.Test, a Clustered Index and a Non-Clustered index based on the Index_Id column. So we will pick a DATA_PAGE from each. Before we can run the DBCC PAGE command we need to enable a traceflag to that the output of the command is returned to the client, otherwise it is only written to the SQL ERRORLOG file. The view parameter takes a value from 0 to 3. A value of 0 returns only the Page Header info, a value of 1 or 2 will include the Offset table, and 3 includes all of the details of the slots. Each view offers it's own benefits so playing around with which one suits your purpose or provides you the information is recommended. The output of this command is where it starts to get detailed as it is reported in Text via the Messages tab. In this case we are looking at the Clustered Index (or Heap) but if we were looking at the Non-Clustered index (as we will below) we would also receive a Result set containing the table of key values and their hash values used by SQL Server to traverse through the B-Tree or Heap structures. NOTE: This is only the Page Header section of the page shown here. 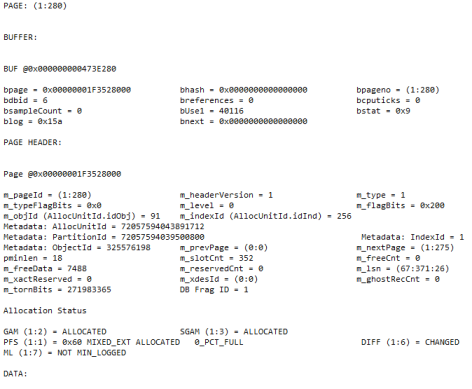 As you can see there is quite a bit of information within the output. To help you identify certain parts of data the following has been provided. m_level Values indicate if the page is located at the Leaf (0), Intermediate (1), or Root level. The following table outlines the numerical values for the m_type otherwise known as the Page Type and their corresponding Name and Description to provide an easy reference when trying to determine which page you are viewing from the PAGE function output. NOTE: The actual output will vary depending on the view mode supply to the PAGE function, or the actual data. 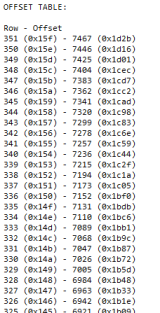 As I mentioned this is the output we receive when looking at the Clustered Index or Heap data, but what about if we look at Non-Clustered data pages. So lets look at page 296 and this time we will use a different view mode param. 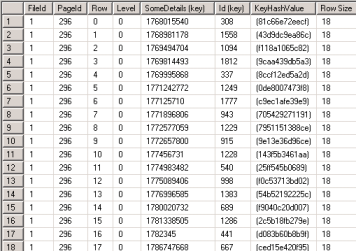 While most output is similar under the Messages tab, we now receive the Results table with a record set describing the Index Key, related key from the Clustered Index (or RID if supported by a Heap table), as well as a Unique Qualifier if we have not specified the index key to be unique because for SQL Server to lock the resource this is required. We are also presented with the Hash key but that is used for resource locking and a whole other discussion. 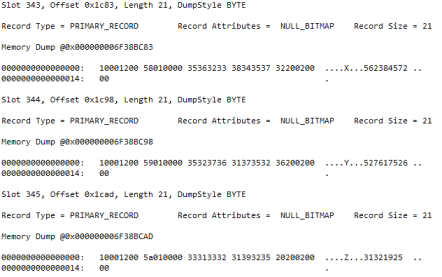 So that is the basics for interpreting the output of the DBCC PAGE command. Of cause once you have the basics you can really get deep into the structure of your data and it can become much more complex, but I hope this guide at least provides a grounding to allow you become more familiar with the structure. I will be posting more about interpreting this data along with the B-Tree or Heap structures, and that process will go much deeper into this topic.